The world of wedding gifts can be a minefield even for the savviest of shoppers. It can be hard to enough to pick up a perfect gift for a close friend or family member, so when you are invited to celebrate the union of an acquaintance or new co-worker, choosing the right present can seem almost impossible. The trick is to concentrate on affordable, general gifts which are slightly generic but still show that you have put in the time and effort to go to the shops. Here are seven ideas to avoid an awkward situation. Most people appreciate a nice bottle of wine. Plop a bottle or red, rose or white wine in a gift bag and you will be ready to go. 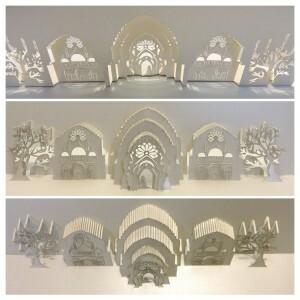 This idea is perfect if you are a last minute shopper as you can easily stop off at the shop on the way to the ceremony. Although the couple will thank you when they receive the wine, if they do not drink or the wine is not to their taste, they can always use the wine to give to someone else for an upcoming event. Although red wine is delicious, it can also be dangerous around dresses and white clothing so protect wedding attire from drops and spills with some UK wedding insurance. A batch of homemade cookies or a cake is another general crowd pleaser and a great way to show off your skills while saving a bit of cash. Even if your creations aren’t award winning, the bridal couple will still appreciate the effort, in a slightly sympathetic way. Bath and body gift sets are always a safe option for any occasion. The pretty packaging and sweet smells are pleasing to the senses and will look great in the bathroom of a new marital home. For extra precaution, look for hypoallergenic products which are kinder to sensitive skin. A nice decorative photo frame is a great wedding gift as the bridal couple can use your present to display a precious moment from the big day. If you don’t know the couple very well, they probably won’t expect you to put a photo in the frame before the ceremony. Like a decorative bathroom set, an ornament like a glass vase or a ornate bowl can add a pleasing finishing touch to a marital home. Look for everyday items which are pleasant such as a nice set of candles. If baking isn’t your forte and arts and crafts gives you a headache, a food hamper is a quick and easy way to create a cheap but personal gift. Buy a small basket then line it with straw or material for decoration. Next, fill the hamper with a few jars, boxes and sweet treats. As an added extra, choose seasonal products such as summer jams or a warming winter soup. If you completely run out of ideas, have gift vouchers or cards on standby. The couple can then use the voucher to pick out something that they actually like rather than politely accepting a gift which isn’t to their taste. No amount of cheap wedding insurance can save a bridal couple from a mountain of dud gifts! 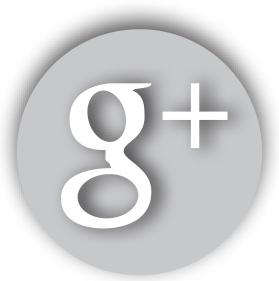 Terisa Able is a freelance content write and marketing coordinator from London. When she’s not working, you’ll find her in Hyde Park with a book and champagne in hand. On what’s likely to be the biggest day of your life, it’s natural to want things to be absolutely perfect on your wedding day. Months of preparation go into planning the guest list, designing the wedding invitations and finding that perfect dress; but the most expensive wedding decision comes in picking the right wedding venue. On average the cost of hiring a wedding venue will take up to 50% of your overall wedding budget, so committing to the purchase is not something that should be taken lightly. The type of wedding you are going to have will be a huge factor in picking the perfect location; are you having a church service, an outdoor blessing, a civil ceremony? You may be able to choose a wedding venue which will allow for both the ceremony itself and the reception after, but if not, alongside picking the right venue comes the decisions regarding transporting your guests. Consider how your guests will reach the wedding venue. Do you need to allow room in the budget for transportation? Is there adequate parking on site or nearby? If you pick a countryside retreat, make sure that all your guests know exactly how to reach your venue – you don’t want them getting lost! You also need to what will happen at the end of the evening. A beautiful country house out in the sticks may be beautiful, but where are your guests going to stay after? If they live far away they probably won’t want to drive home, so check there is adequate accommodation nearby. Think carefully about the head count for your wedding too, as a venue needs to allow for your full guest list comfortably. As you ponder the size of a venue, think also about the potential layout for your day and evening. Is there room for a dance floor and band or DJ? Is there room for enough tables and chairs? Will everyone be able to see the head table? Have you always dreamed of an outdoor wedding? In some countries such as the UK it’s not an easy option, as you cannot legally get married other than in a licensed wedding venue. Speak with an adviser at your registry office however, as you may be able to get legally married there in advance and enjoy a religious blessing in the great outdoors on a separate date. If you do opt for an outdoor blessing, keep in mind that you may have unplanned spectators (in the form of the general public). How about the overall aesthetics of your ideal wedding venue? As you browse potential properties, pay attention to the décor and furnishings – do they fit with your wedding theme and colors? Look out for any picturesque features that may enhance your wedding photos – such as chandeliers, period furniture, beautiful architecture or outdoor water features. 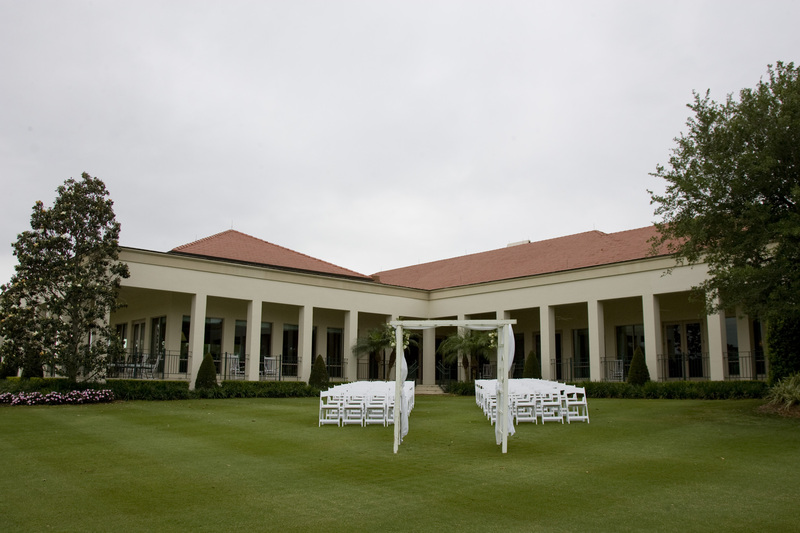 Also discuss your exact requirements with a wedding venue before booking. 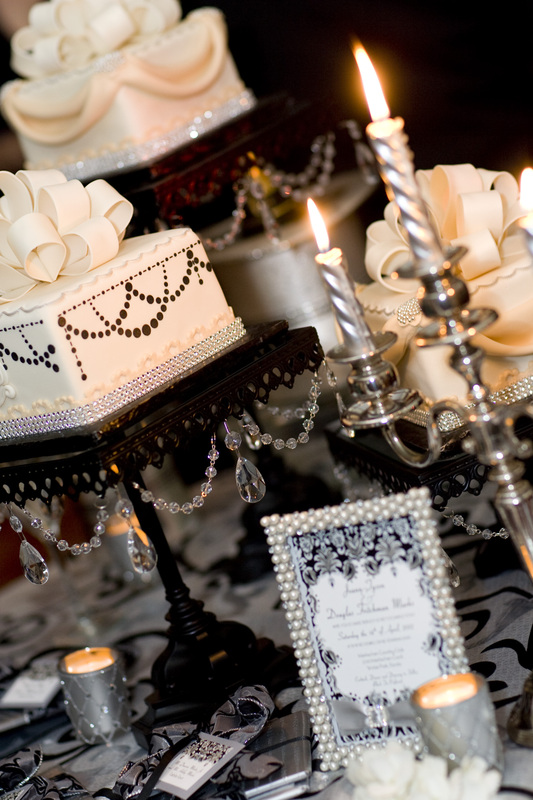 Let them know your budget and what your ideal specifications would be in terms of catering, bar and décor. Many venues can provide an all-inclusive package. If planning a wedding seems like a daunting help, get some help. You can hire professional venue finders to act on your behalf to find you a suitable venue and a lot these people have contacts within the industry, meaning they can get you a venue at a competitive rate. 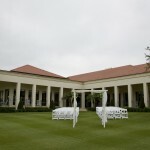 The venue sets the tone of the wedding – outdoor can be more casual, more green, less clothing while indoors at a Country Club or resort can be very upscale, black tie events. If you have a vision in mind, make sure the venue you choose matches that. And once you do decide on the venue and date, don’t forget to get your Save the Dates out as soon as possible – Save the Date cards should go out no less than 5 months before and longer if a destination wedding. 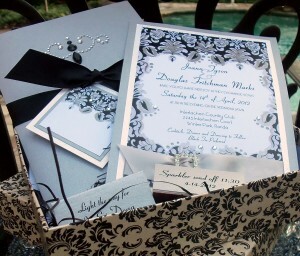 Work with a custom wedding invitation company to make sure that your venue and your theme match the invites going to the guests so they can plan accordingly! 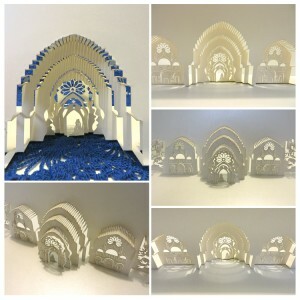 Music Box Invites has teamed up with an incredible artist to offer brides even more unique choices in wedding invitations. 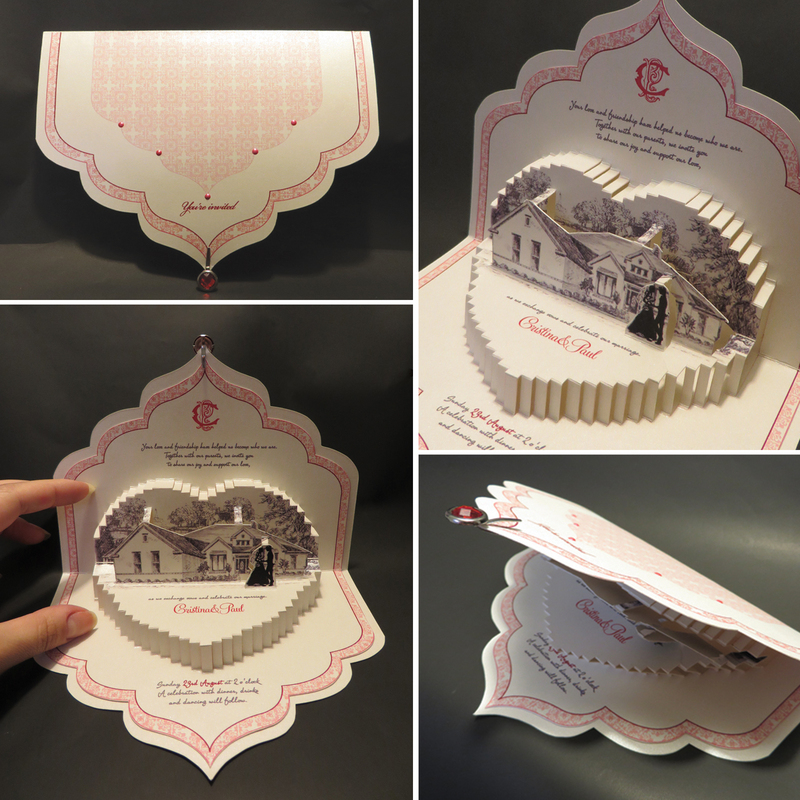 We can combine her paper engineered die cut invitations with our musical boxes for a truly OVER THE TOP invitation that will astound your guests. 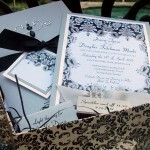 Pricing will depend on the complexity of the invitation but will begin at about $30 per invite including the box and music. 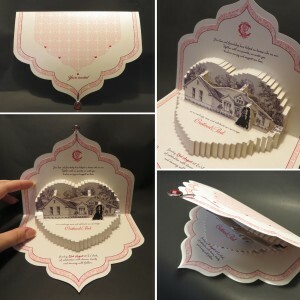 Olga Cuzuioc Sinchevici is the creator of these unique handmade paper invites. Olga was born in Republic of Moldova and lived in various countries and cities since age 14, which gave her the opportunity to explore the world and different cultures. She loves anything that gives her the opportunities to be creative and explore new things. 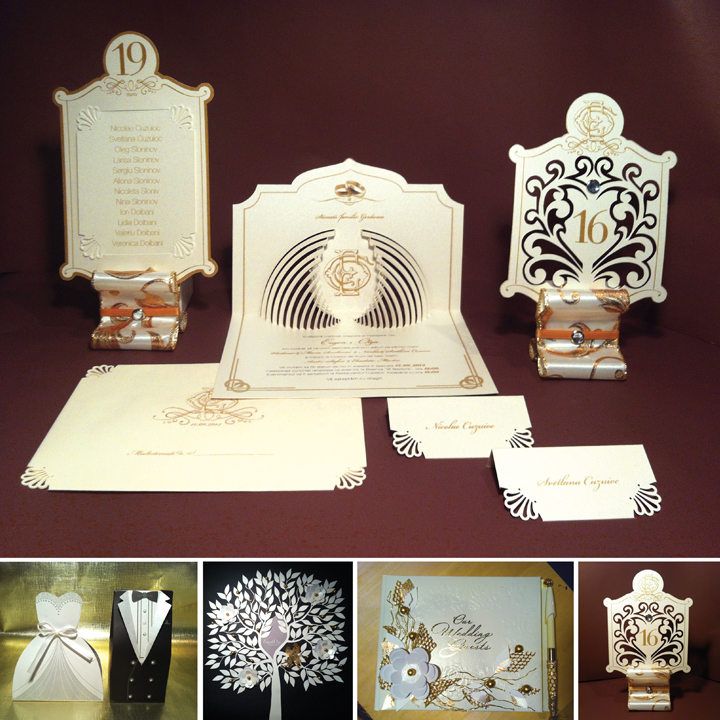 Her complex and highly detailed invitations have been done for a few upscale weddings in Europe & USA. All of the invitations were hand made and custom made and use special patterns/die cuts. She is passionate about paper engineering, invitations and fine art. “I am an enthusiastic and motivated art director committed to producing a high standard of work”, says Olga, “I would like to think about myself as of a highly creative thinker looking to apply a unique range of talent and experience to my designs.” She has a degree in Advertising and Graphic design, graduating as an outstanding senior from Columbus College of Art and design. Her previous work experience is in the corporate world, small business, government and design agencies. Whether you are promoting a product, sharing an announcement or celebrating a special moment, we can help you discover the power and potential behind a personalized product/card – especially when we add music or sound to these spectacular products. To learn more about these products, contact Joann at Music Box Invites. 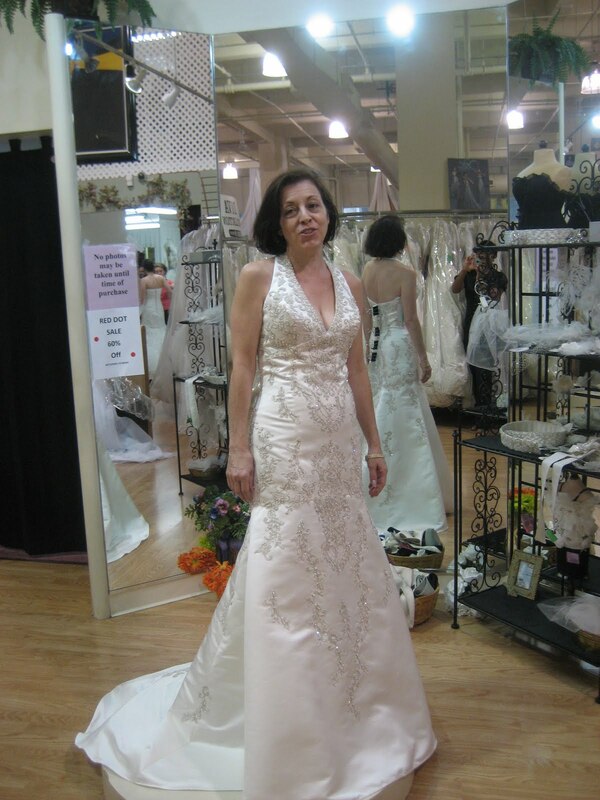 Choosing a wedding gown — at any age! 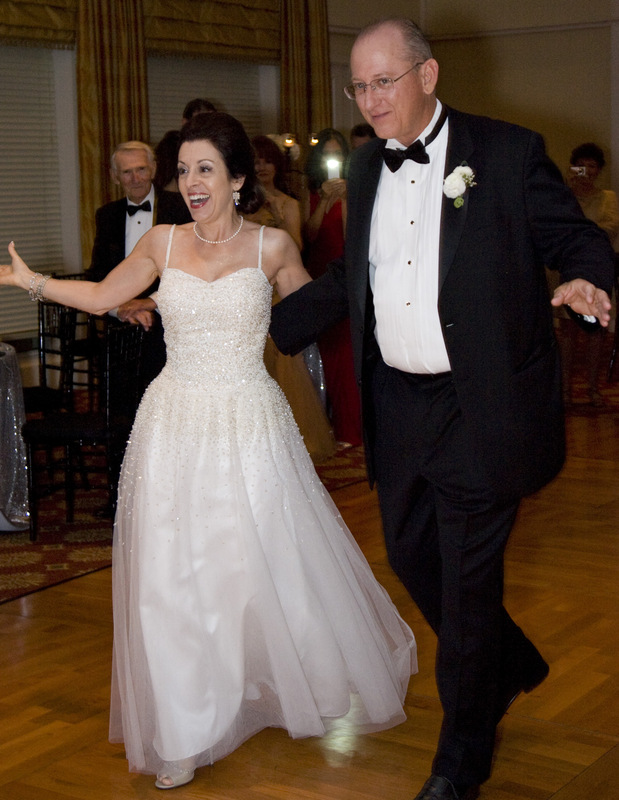 Getting married again at 52 was a surprise but it did give me the opportunity to right a wrong from my past wedding. For some unknown reason, I didn’t have a wedding “gown” the first time around but instead had someone make me a dress. I had cut something out of a magazine (completely ignoring the fact that it was on a professional model who was 6’ tall and thin and blonde) and asked my dressmaker to make that dress, but short and in PINK. He also added a removable train and puffy sleeves so basically I looked liked Snow White in a Pepto Bismal bottle. It was awful. Not to mention the 80’s hair and makeup … I cringe when I look at those pictures. This time I was getting a wedding gown. Not just any gown but the PERFECT gown. This shouldn’t be too hard, I wore gowns a lot to charity events and always found lovely ones. I just didn’t understand how different Bridal Gown Shopping was! First of all, the gowns never look like they do in print for some reason. And then there is the whole sizing thing .. I am a size 2. Trust me (except for maybe David’s Bridal), there is not a gown in my size to try on so you have a dress on with industrial strength metal clips in the back holding it on. Very difficult to imagine what it would look like when altered. And then most places have a “no picture policy” until you purchase it. I mean the dress you are going to have the most pictures ever taken of you in your life and you can’t see a photograph before you purchase it? That really would have been helpful. First Gown – I didn’t see this picture until months after purchasing … the mirror lies! My first stop for a gown was in New York City. A girlfriend flew up with me and we went to a few different shops. But the first place we went was overwhelming. It was the size of a football field and crammed with gowns of every designer, color, etc. I had brought pictures of gowns I liked and even though my friend encouraged me to try all different styles on, I had tunnel vision and ended up trying on mostly fit and flares. I had also thought I wanted a halter style because a lot of my regular gowns were a halter and that was always flattering. Anyway, 2 hours later and a very nice salesperson, I walked away with gown #1, a gorgeous Watters “sample” gown that was marked down to just $400 (from $1200) because it had just been discontinued. I was pretty happy and even though we went to two other stores, I was fairly confident that this gown was the one. Until I got it home and got copies of the pictures that my friend took of me in it. I was shocked; the gown didn’t look as good as I thought it had in the mirror! A trip to the seamstress confirmed my mistake and even after a few meetings with ideas on how to alter it, we finally came to the conclusion, this dress was not going to work. So less than 6 months from the wedding, I am back on the prowl for a gown and now in Orlando. Three of the 4 gowns! I had always planned on a 2nd dress to change into after the cocktail hour so that I could dance the night away with no fear of ruining my dress or dealing with the train (bustled or not, it is still not a great thing to dance in). So dress #2 was found at a remote dress shop that had a clearance rack and a ballgown style dress (yes by this point I was trying on all types of styles) that was pearl encrusted at the top and layers of tulle on the bottom. We kind of rebuilt the bottom half of the dress but in the end it worked well for the reception dress. But still no ceremony dress and panic is setting in. We did all the major bridal shops in town and either were turned off by their service and/or their prices. I really couldn’t see myself spending more than $1500 for a gown and was really hoping for one under $1000. 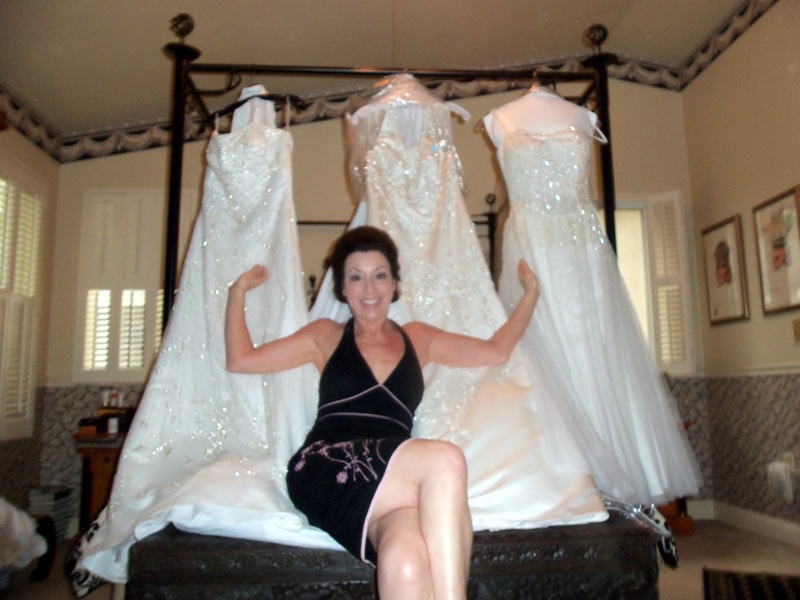 I then went to East Orlando and had a shop hold a couple of gowns for me so my friends could all weigh in. We liked one the best (a Christina Wu) and I bought gown #3. Now this is a gorgeous dress and it looked good on me. But something still nagged at me. 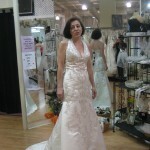 I had tried on a size 14 Justin Alexander that I kept thinking about. Now it is 3 months before the wedding and I do the online search for that gown in my size and finally find it and order it. The minute I put it on, I knew that was the gown and now I had TWO gowns to sell. 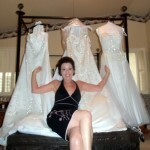 It took about 6 months but I did sell both of them to two VERY happy brides who ROCKED the dresses that didn’t work for me. So while I lost money (and time) on the deal, I console myself with the knowledge that I made two other women very happy. What did I learn from this experience (and am now lucky to share with my step daughter)? Cut out pictures but remember these people are models! Try to find pictures of the REAL wedding brides. And forget ordering on the internet — unless you have tried the gown on in person, they never look like they do on the internet. Besides many are fakes and knock offs and that could mean poor quality. Listen to my friend – try on all the styles. While I kept searching for fit and flare gowns, I ended up with an A Line. So try them all on. My step daughter said no lace but at the last moment tried on a dress with lace that she fall in love with. So don’t be stubborn, try them on. 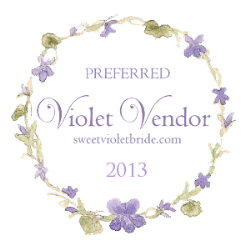 Don’t be pressured to buy – especially if it is not a one of a kind sample sale gown. And even those they will usually hold for a day so you can come back. Try to shop places where they allow pictures so you can see quickly how that dress looks on you. Photos can pick up things that the naked eye just doesn’t and you need this dress to look good in photos. Don’t bring a crowd, try to bring only one or two people with you. And make sure it is someone who will be truthful without being pushy. Just because THEY like it, doesn’t mean you have to. Make sure your hair and makeup is done nicely when you shop and ask them for a veil and flowers so you can see the whole effect. My step daughter really felt adding the veil changed the whole look of the dress. Remember you can embellish the dress with a belt and jewelry so don’t be afraid to keep the dress simple. White doesn’t really look good on anyone – 99% of all the gowns sold are off white or diamond white so don’t let that color be your guide. The dress needs to be comfortable. The last thing you want on your wedding day is a dress that is so tight you can’t breathe or sit down. Or one that itches. Start early! Many gowns take 3-6 months to come in so you want to start early just in case yours has to be ordered. 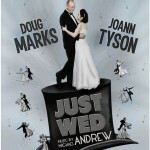 Joann Marks is the founder and co-owner of Music Box Invites – the ONLY custom musical invitation company! Planning the #Perfect #Wedding – the 2nd time around! When I got married for the first time 25 years ago, there were a lot less choices to be made. I mean basically there were two types of cake and not tons of linen choices. Weddings were not “themed” as much as just “colored” and most favors involved Jordan almonds. Luckily for me, I got another chance at love and marriage AND the fun of planning a wedding in this new era of “anything goes” weddings. Celebrating our first anniversary this past April, I am still very happy with the choices I made for our wedding. First of all, we didn’t invite all those distant relatives that our parents insisted you invite when you are in your twenties. We only wanted the dearest and nearest of our family and friends to share this important day with us. I wanted to be able to totally enjoy the day and not have to talk to people I barely knew. By keeping our guest list to a minimum, we were able to provide an over-the-top party for those who attended. For young brides I urge that you limit your guests and remember that the more people there, the less time you will have to enjoy yourselves because you will be spending time interacting with your guests. You don’t have to allow “plus ones”, if these are your closest friends and family, they should know each other and be able to attend and enjoy themselves without bringing someone you don’t even know to your wedding. Our first good choice (other than with each other) was our venue. 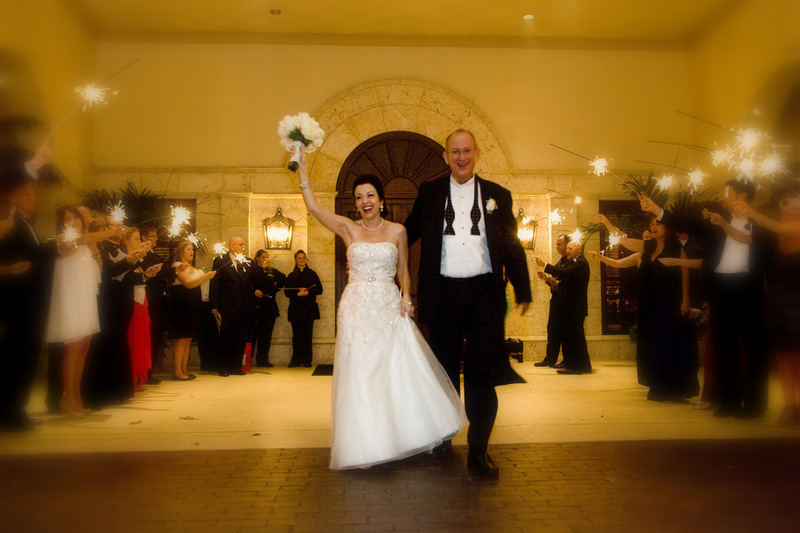 We wanted the ceremony outside by a lake but the reception inside and very elegant Interlachen Country Club (in our home town Winter Park, Florida) not only gave us that but also had incredible food, a wonderful event planner and the prices were actually LESS than our other choices. I can’t say enough great things about Natalie, their food and beverage manager. I didn’t need a day of coordinator because she was all over it. They also gave us so much space and arranged the furniture so we had lovely seating areas. We had two different adjoining rooms – first one was for the cocktail hour and then hosted the bar, and the large ballroom was for the reception. But we also had the patio outside where the men went and smoked cigars and there were lovely wood rocking chairs for people to sit and enjoy the evening. We brought in champagne, had an open bar and had wine served with dinner (diners had three choices). We also served the side dishes “family style” so people could have more if they wanted. No one left hungry and everyone raved about the food. Remember all this when choosing a venue – the ones that provide the most items make it easier because you only have to deal with one person. I can’t imagine how hard it would have been to deal with a separate caterer and such. It was also a perfect room for our “theme” – 1940’s Hollywood Supper Club. 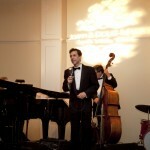 Lucky for us, we were able to have recording artist, Michael Andrew perform at our wedding and he was so fabulous. Michael is a Frank Sinatra style crooner and was the youngest conductor at the Rainbow Room in New York, played at the Coconut Club in LA, and is heading to Broadway in a new musical version of The Nutty Professor. I think I will always have fond memories of him coming to our house a couple of weeks before the wedding to go over the song list. He practically performed a private concert as he sang examples of some of the songs. The ceremony was lovely outdoors by the lake. My nephew walked me down the aisle to the traditional “Here Comes the Bride” and my husband and I exchange vows we wrote for the occasions. Lots of laughs and tears later, we departed to “The Best is Yet to Come” and our guests made their way into the cocktail hour. We had a jazz trio playing some New Orleans Jazz as well as old standards and trays of french inspired appetizers were passed around. Of course, there was an open bar and bins of ice cold champagne bottles. We used tall vases with feathers on the tables to complete the Hollywood theme. The reception ballroom was set up with a stage for Michael and his 3 piece band (including a baby grand piano player) on stage and the dance floor running the length of the ballroom with small round tables circling it and of course, we had our sweetheart table right on the dance floor. 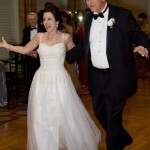 The reception began after i changed into my 2nd gown and we began our First Dance. Our dance instructor, Michael Dean was (and is) amazing. 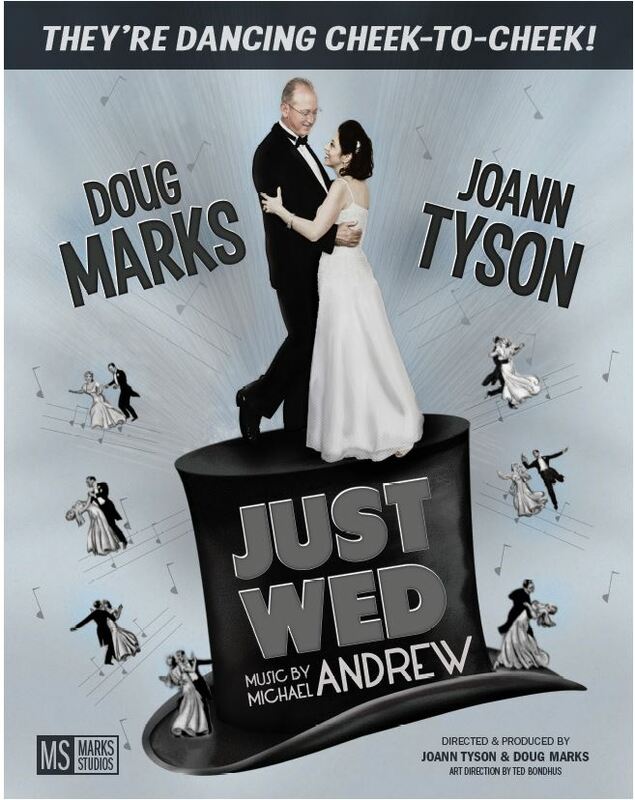 Our song was Fly me to the Moon (which Michael Andrew did a special recording of just for us to practice with) and Michael Dean (the Dance Doctor) choreographed the perfect wedding dance. We looked like winners from Dancing with the Stars and absolutely amazed our guests! That song was also a very important element to my wedding invitations. You see, I wanted the invitations to play the song when opened by my guests and couldn’t find anyone who could do it. So I had to do it myself! 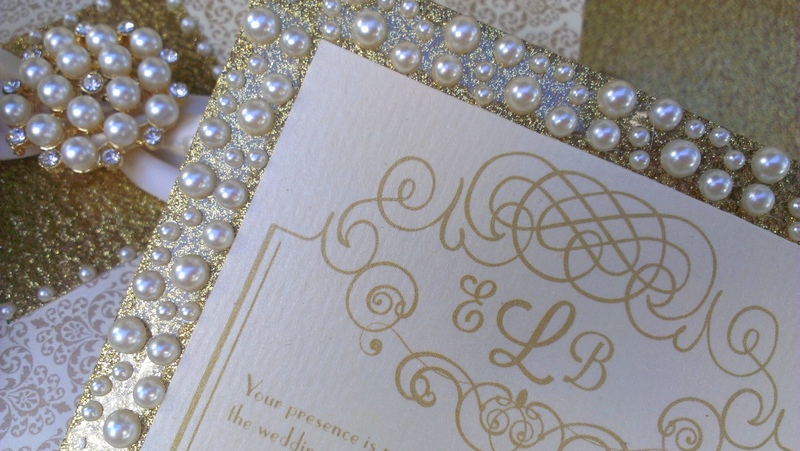 I worked with a custom invitation place and then ordered the music chips and put the whole thing together. It worked so well that I partnered with a friend of mine and we began Music Box Invites to provide this service to other brides. I got my chairs from A Chair Affair but owner Ann Taylor offered much more than just the chairs, she was my go to person for advice on other vendors. She was so helpful (and today carries all types of rentals) that I just can’t thank her enough for everything she did to help me. Linens were a challenge because of the carpet at Interlachen (very busy and odd orange/brown/gold coloring). My colors were Silver, Champagne and Black. But Over the Top Rental Linens were fabulous (and very patient) to work with. I wanted the room to be lit mainly by candlelight and for it to really shimmer. So we ended up with a silver glitter overlay and black sequined placemats instead of chargers (the chargers would have only been on the table for a few minutes, whereas the placemats stayed all night). 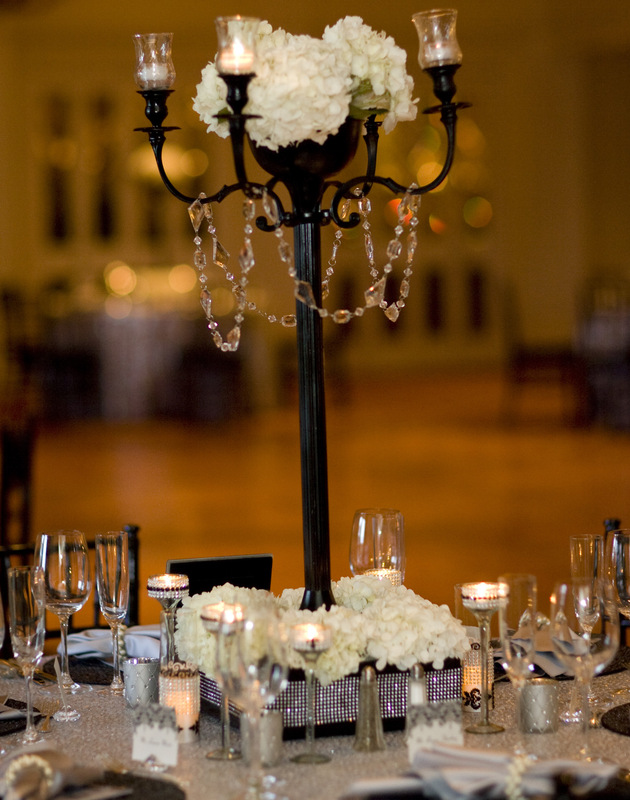 The centerpiece of each table was a tall black candelabrum positioned in a square rhinestone covered box that had creamy white flowers in it. The table was accented with candles adorned with crystals and each table number was a framed picture of a famous Hollywood Couple and the menus featured Doug and I in a movie poster knock off of (the Astaire/Rogers) Top Hat. Inside the menus was a story on the Hollywood couple for that table. Guests visited other tables to find out about the other menu’s during the evening and some tried to collect all 10. Finding a photographer was difficult – so many of them had really great photos and examples to show us. In the end, I was most comfortable with Sterling Photography. Our engagement shoot was done as an Old Hollywood photo shoot and we were able to use those photos on the menu’s and CD covers (our favor was a CD of Michael Andrew’s Tribute to Frank Sinatra). I really appreciated the website “here comes the guide” which gave me checklists to take to my meetings and helped me with my photo list. We made sure to take a picture at each table so we had pictures with all our guests. Remembering that after my first wedding, we only watched the video the next day, I didn’t do a video except I had a friend video tape and edit the first dance video. While our reception flowers and my bouquet came out great, we had a problem with the florist overall so I won’t mention that vendor. The only advice I can give is to make sure that you get pictures beforehand of WHAT your flowers will look like to make sure they are making what you want. I had given the florist pictures of what I wanted for the cocktail hour and he didn’t follow that AT ALL. It was totally different and that was upsetting to me because he promised me they would be what I wanted (I was going to do them myself since it was just a tall vase with feathers – no flowers) but he insisted. It was really the only misstep other than some disco lights our lighting guy gave us for free that we didn’t use. My cake lady, Everything Cake probably won’t ever do another wedding cake after me. Originally we were doing a standard 3 layer tiered cake but when I saw these cake plates, I knew I had to changed it to three cakes. After a lot of back and forth and sketching, she DID create the most perfect cakes and we were very happy. I just wish the day could have last longer but the memories (and our photo books) will last a lifetime. And now I get the great pleasure of helping my step daughter plan her wedding! Joann Marks is the founder and co-owner of Music Box Invites, contact her here! Many traditions and superstitions are associated with wedding ceremonies all around the world. While many old wives’ tales and dated stories remain firmly in the past, some of these rather paranoid customs are still celebrated now. In fact, some superstitions have become so ingrained in today’s ceremonies that we don’t even think to question them. We have comprised a quick list of wedding superstitions to help make your big day a little luckier. Wedding superstitions regarding names and surnames are perhaps the most unavoidable and frustrating for any bride who wishes to practice them. According to the old rhyme ‘To change the name and not the letter is to change for the worst and not the better’, it was deemed unlucky to marry a man or woman whose surname began with the same letter as your own. On the same note, a similar tale also thought that it was unlucky for a bride to write down her new surname prior to the wedding as this would be tempting fate. Couples today recognize the ‘ring finger’ as a common fact rather than a superstition. However, like all customs during a typical ceremony, even this small feature has its origins. According to sources, the ancient Greeks were the first to wear their marital rings on the left hand on the fourth finger as they believed that the vein within this chosen finger led directly to the heart. Before this idea was introduced to England in the 1700’s, rings could be worn on either hand and on any finger. Perhaps this also explains why it is bad luck for a bride to take off her engagement ring before her big day. Team your engagement ring with a sparkling manicure before your big day by heading to Secret Salons - With over 50,000 venues across the UK, the directory is increasing by the day. Even better the site offers great special offers. Many bridal looks are teamed with a beautiful pearl accessory, not only because they work well with a traditional white dress, but because they are also said to represent either good luck or bad luck – whichever you want to follow! According to superstition, the pearls represent the bride’s tears in either version, however, they can either symbolize a tear-free marriage or a tearful marriage. Unfortunately, there are no bridal guides for choosing the right pearls. 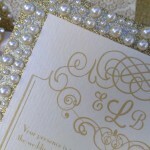 Many upscale, custom invitation companies are incorporating pearls into their designs. Keeping your lavish wedding dress away from the groom before the ceremony is a nice idea in itself as it prolongs the mystery until the final moment. However, it may be surprising to know that this wedding tradition actually has a less romantic origin. Many marriages in England and the rest of Europe were arranged by fathers seeking better titles, money and land. According to myth, many fathers were worried that the lucrative deal would be called off if the groom were to see his pride and joy before the big day. The humble magpie has been the subject of many tales of luck and bad luck over the years. In old folklore, seeing one magpie represents death while two symbolizes prosperity. If a bride saw three magpies prior to the service, the creatures would give her good luck in her new marital path. We hope that this array of superstitions has given you an insightful if not enjoyable look into the world of weddings before your big day. If you have any unusual family customs which you plan to follow, let us know! Nowadays, the busy schedules of youngsters often leave them fall short of time or money, or both. 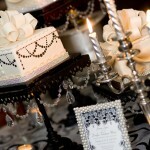 Today, financing a wedding has indeed become a tough task. The beach weddings provide a cost-effective and smart solution to the headache associated with a traditional wedding. Usually, the beach weddings are easy to plan, cheap and ensure fun for everyone, including the guests! Here are some tips to ensure a cost effective wedding. Do your research and learn what the annual rainfall is the month you want to get married. And have a back up plan! You don’t want your wedding to be totally rained out if you are doing it on the beach. Many beach resorts have covered areas that will still give an excellent view of the water in case of rain. Usually the beaches are very windy, hence try choosing a location, which offers protection from direct wind and helps keeping you safe from the high tides. Plus, Some areas near beaches are prone to hurricanes or storms, so plan your wedding accordingly. Make sure you know the legalities and find a beach that allows weddings, this is easily done if you are working with a hotel resort on the beach but harder if you have a favorite stretch of public beach you want to use. Find out a wedding planner in the beach town you choose, so that you can perform the wedding ceremonies. The planners also offer useful recommendations regarding the affordable wedding packages and deals for a perfect honeymoon as well. The wedding packages have gained popularity nowadays and are a perfect solution for the busy couples. Such packages include everything from the flowers to the marriage licenses. The beach is so beautiful it doesn’t always need lots of decoration. 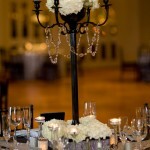 It is a cost effective idea to decorate the wedding place with small twinkling lights and satin flowers. You can also choose real flowers if your budget allows. Again, make sure it is OK to use things such as candles or torches before setting your heart on them. Keep in mind that comfort and safety of your guests is very important. Check the seating arrangements for seniors, women and children. If you have guests who have certain type of disability, then you need to recognize that it is not possible to push a wheelchair through the sand. Check for the availability of trails or platforms, and ask the guests to use them if needed. Make sure you think about your gown (and bridesmaid’s dresses) very carefully. A beach wedding can be elegant but it is also more casual and your gown should be appropriate, not as heavy (beaches are hot), and not with a long training train (beaches are dirty and hard to walk on). So take all that into account and decide what is more important to you — the beach scenery or a couture wedding gown. You can choose the perfect time for wedding according to the local weather – . If you have wedding planned for afternoons, choose your clothing accordingly and arrange for sunscreen. Make sure to have parasols and plenty of water available for guests. You don’t want to cause sunburn! A casual hairstyle works best for beach weddings. If there is heavy breeze, give a messy look to your hair. If you have a long list of guests, consider choosing a hotel or resort facing the ocean with a balcony to provide the reception after your ceremony beside the beach. And of course, make sure to carry the Beach Theme through. Start with your Save the Date and your wedding invitations so guests know up front it will be on a beach and plan accordingly. Music Box Invites have some awesome beach invitations that can include beach type music (such as “Somewhere Under the Sea” or a calypso “Wedding March”) that plays when the box opens. 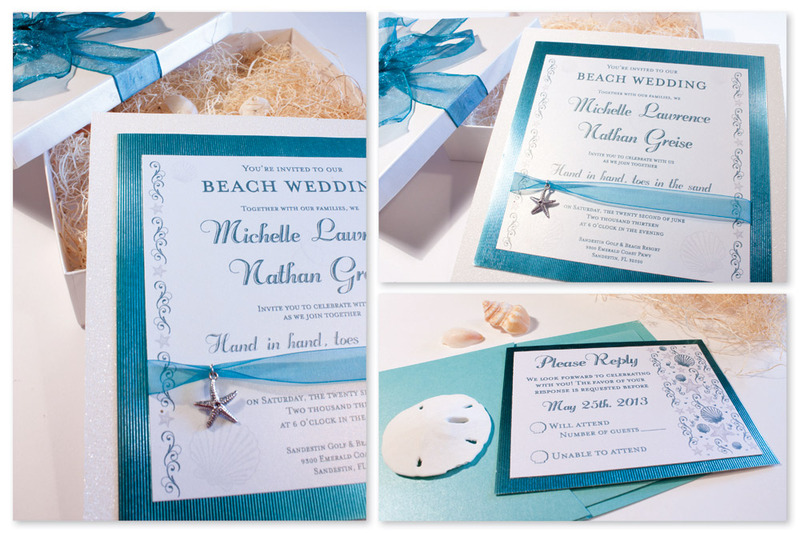 Consider adding seashells to the invitation tied with a raffia style ribbon. Giving them a lot of advance notice will help your guests – they may want to make it part of their vacation so make sure to suggest places to eat and stay at. Although there are many service providers who offer all-inclusive beach wedding packages, but do not wait until the last minute to make your reservation! The trend of beach weddings is huge and it is best in your interests to book everything beforehand to avoid mess later on. It is advised to book your package at least six months in advance. Do you want to do something to help others after your wedding day? Try extending your hand to others during your honeymoon. How? Volunteer. At Music Box Invites, we believe in volunteering and encourage all of our associates to volunteer in their community. But we had never heard of doing it on a Honeymoon before. There are quite a number of advantages of volunteering. One of them is the devotion and support you give to people who are in need. You do not have to volunteer selflessly but you can imagine how colorful it will be when you visit people from all walks of life in different countries. Volunteering will feed both your mind and soul. Additionally, you will enjoy things you might miss if you were staying in a beach resort. Flying to a resort may not give you the chance to enjoy what that place has to offer. When you volunteer, you will get the opportunity to experience the culture of the place. Volunteer destinations may not be very attractive at first glance but you will soon fall in love. Knowing the struggles of other people and sharing with them is a very satisfying experience. It could be a great way to begin your marriage – working together for a cause you both believe in and a way to see the world a bit. Many of the newlyweds that have tried this program say that it can be satisfying doing something for others. The people you help may not be needy, they may be children from Thailand wanting English lessons, or environmentalist from Australia trying to save sea life. The choice of the cause is all yours, but this is a perfect present before you start your new marriage life. Before you choose a destination, it is important to select a particular volunteer cause. Programs are many and in different countries for a wide choice by honeymooners so check out different websites that can direct you to volunteer organisations in the world. Whatever you decide to do, it will enrich your life and your marriage! You have finally decided to hire a live wedding band for your big day’s reception. And as with most brides or grooms, you are likely expecting them to put their best foot forward to get the crowd stoked and make the occasion memorable. Take note, however, that just because you will be paying them for the job does not mean you can leave them to their own devices. Keep in mind that although the wedding musicians you have hired are professionals and will make everything in their power to make you happy on your big day, there are important things they need that will help them deliver a performance like no other. These are something you can assist them with, so be sure to plan for them well in advance to avoid problems later on. Even a seasoned band with the nicest instruments will disappoint guests if they do not have a good sound system to work with. Although most wedding bands prefer to bring their own sound systems in the events they perform in, some reception sites do not allow this. In such case, it is best to coordinate such matter with your live band so that they will be able to make the necessary adjustments for their performance. Ask what equipment they will need to get the right acoustics and ensure that it is available in the reception site. Of course, it is equally important to let the group do sound check days before the wedding. This will allow them to make sure the sound in the room is clear and at the right volume and frequencies. A great reception party always starts on the stage. So to make sure your chosen wedding band will deliver, provide them a stage that is both safe and spacious. As a rule of thumb, the stage should be wide enough to allow movement and sturdy enough to support the weight of the band and their instruments. Placement of equipment and wires should also be planned in advance to prevent them from becoming trip hazards during the band’s performance. Also, avoid using the reception’s dance floor as the main stage as it will make the group look unprofessional. A floor-level stage will make it difficult to invite guests to enjoy and will also make it a challenge for the musicians to deliver announcements, since guests at the back of the room will not be able to properly see them. To achieve a good stage, work with your wedding band and the venue. Discuss the right elevation and dimensions for the stage as well as the most suitable placement that will allow them to interact well with the crowd. Then, relay everything you have discussed with the reception site’s manager so that the necessary preparations will be carried out. Take into account that your live band will probably arrive several hours in the reception venue before the actual party to set up their instruments, do sound checks, and prepare their attire. With such hectic schedule, some of them will probably forget to take a break and catch quick meal. As the gracious host, it will not hurt if you provide them something to eat and drink before the reception begins and in between their sets. Doing this will accomplish two things: you will be able to prevent the band from going out to get meals for themselves, thereby avoiding the possibility of delays, and they will have enough energy to give their best performance during the reception. 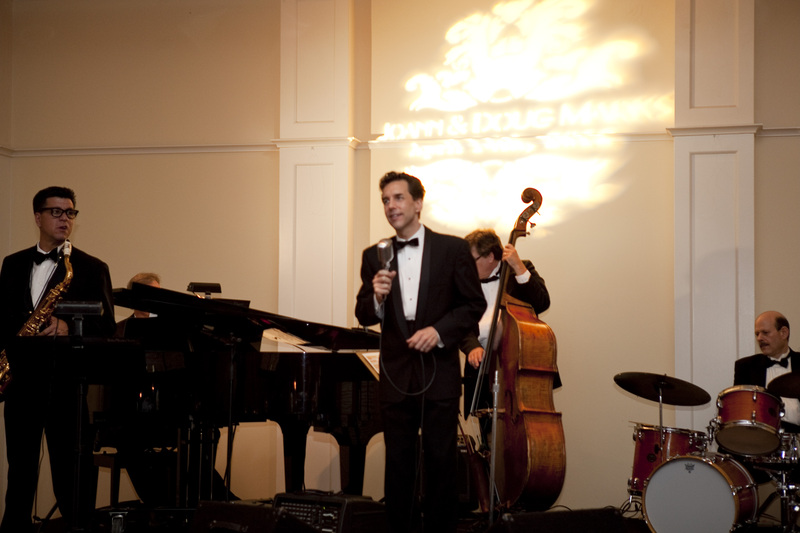 When all these things are met, there is no doubt that your chosen live wedding band will go the extra mile to make your reception an event your guests will never forget. Our Guest Blogger today is Jessica Lewis, a freelance writer who is particularly interested in writing insightful posts about weddings. Currently, she regularly contributes content for www.northernstarmusic.co.uk.